Gold Crowns or Porcelain Crowns? 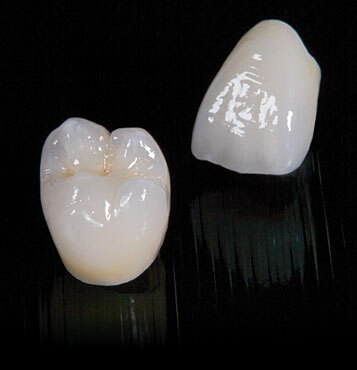 When you need a crown, there are actually three options in materials: gold, porcelain-fused-to-metal, and all porcelain. There are pros and cons to each material. There are specific conditions in which each material is indicated. Every patient and crown is different and the decision should be a joint decision with your dentist. It is important to have this discussion with your dentist as every case and decision is personal for every patient. Our team at Adams and Cheek is always here to answer any of your questions. This blog post aims to simply provide some baseline information to help you begin to make your decision. For anterior (front) teeth, all porcelain is the way to go. All p orcelain crowns at Adams and Cheek are made on site and shade matched perfectly to your surrounding teeth. They have no metal in them and therefore will not develop a dark shadow or expose a dark edge next to your gums over time. Back teeth or molars can also be made in all porcelain. If cosmetics are a priority to you, a good rule is that if you see it when you smile- go all porcelain. Gold crowns are the strongest material you can make a crown out of. Gold wears the most similarly to tooth enamel and is ideal for people with strong jaws who grind or clench their teeth. If you have chipped or cracked teeth in the past, gold may be the best option for you. Gold crowns have the longest lifetime of any material and are a popular option for dentist’s own teeth. Gold crowns are often recommended for back molars that are not in view when you smile. 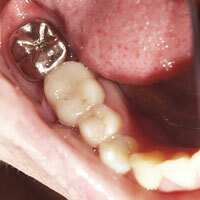 The third option for crowns is porcelain-fused-to-metal. These crowns have been around for years and are a combination of the two. 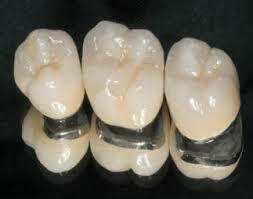 A custom made porcelain layer is fused to a metal base which protects the existing tooth structure. Over time, the darker colored metal can appear near the gum line around the tooth. Porcelain-fused-to-metal crowns are a good option for back teeth in individuals who really do not want to see gold anywhere in their mouth. To read more about crowns, and the materials they are made of visit Colgate’s Oral Care Center. Call us at Adams and Cheek Dentistry today to schedule your next appointment at (919)866-1360 or click here to request an appointment online.